In 1928, Jessie Clark headed to Wineville, California to visit her brother and her uncle. While there, Jessie’s brother, Sanford Clark, told her of the horrendous murders that had taken place over the last two years. Sanford had been sent from his home in Canada in 1926 to live with his uncle, Gordon Stewart Northcott, who lived in California on a chicken farm. Frightened, Jessie returned home to Canada and reported the stories to the American Consul in Canada who then notified the United States Immigration Service. On August 31, 1928, the service visited Northcott’s ranch in Wineville, where they found Sanford Clark but no Northcott. On the ranch, the agents discovered several graves with partial body parts. Sanford had shared that Northcott and his mother, Sarah Louise Northcott, had taken the bodies to the desert and burned them when news of visitors had reached the ranch. Once found, Gordon Stewart Northcott confessed to killing more than five boys but later retracted his statement. The only bodies that had been found were of Northcott’s alleged first victim, a Mexican boy known as the “Headless Mexican” and two brothers, Lewis and Nelson Winslow, who had been reported missing on May 16, 1928. 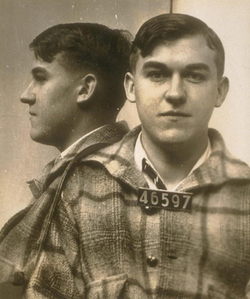 On February 13, 1929, Gordon Stewart Northcott was convicted of the three murders and was sentenced to the death penalty by Judge George R. Freeman. Gordon’s mother had confessed to the murder of Walter Collins, who also later denied her statement. After being extradited from Canada to California, she once again pled guilty to Walter Collins’ murder. On December 31, 1928, Sarah Louise Northcott was sentenced to life in prison. The story of Walter Collins is the most known out of the Wineville Chicken Coop Murders. Nine year old Walter Collins was reported missing on March 10, 1928. Although Walter’s disappearance received nationwide attention, there were never any successful leads. Five months later, a boy claiming to be Walter was found in DeKalb, Illinois. At the mother-son reunion, Walter’s mother, Christine Collins, denied that this boy was her son. Captain J.J. Jones, the officer in charge of the case, told Mrs. Collins to take the boy home and “try him out for a couple of weeks,” and Collins agreed. After three weeks passed and still claiming this boy was not her son, she was committed to the psychiatric ward in the Los Angeles County Hospital. Captain Jones questioned the boy while Mrs. Collins was incarcerated, who admitted to being 12 year old Arthur Hutchins Jr., a runaway from Iowa. Christine Collins was dismissed from the hospital, and connected with Gordon Stewart Northcott. Mrs. Collins had her first interview with Northcott on December 7, 1928. When asked if he had killed her son, Northcott lied, confessed and recanted. Mrs. Collins still had hope that her son was alive. On the eve of his execution, Northcott had sent Christine Collins a telegram saying that he had lied, and wanted to tell her the truth in person. Once she arrived, Northcott stated, “I don’t want to see you,” “I don’t know anything about it. I am innocent.” The dreadful story of the Wineville Chicken Coop Murders and Walter Collins are the foundation for the 2008 movie, the Changeling. "Wineville Chicken Coop Murders." Wikipedia, the Free Encyclopedia. 29 Jan. 2012. Web. 05 Feb. 2012. <http://en.wikipedia.org/wiki/Wineville_Chicken_Coop_Murders>. "Wineville Chicken Coop Murders." Wikipedia, the Free Encyclopedia. Wikipedia, 29 Jan. 2012. Web. 07 Feb. 2012. <http://en.wikipedia.org/wiki/Wineville_Chicken_Coop_Murders>. SoTrueProductions. "Changeling Trailer - YouTube." YouTube - Broadcast Yourself. Youtube, 14 Sept. 2008. Web. 07 Feb. 2012. <http://www.youtube.com/watch?v=57_t2BFZaK8>.